Update 6/26/50: One day after this column was originally published, the University of Virginia’s 15-member Board of Visitors voted unanimously to reinstate Teresa Sullivan during a brief meeting held at the university’s historic Rotunda, Associated Press reported. Shortly after the vote, Sullivan thanked the board members for their renewed confidence in her leadership of the prestigious institution founded by Thomas Jefferson. “I want to partner with you in bringing about what’s best for the university,” Sullivan said as cheers erupted outside the Rotunda where her supporters had gathered. After two weeks of turmoil over the forced resignation of University of Virginia (UVA) President Teresa Sullivan, Virginia’s governor has ordered the university’s board of advisors – whom he appoints – to resolve by June 26, 2012 the issue of UVA’s presidency or be replaced themselves. This is more than a drama about a few business leaders trying to unilaterally dictate university direction and determine the pace of change. It is also more than a very flawed governance process forcing the president out. 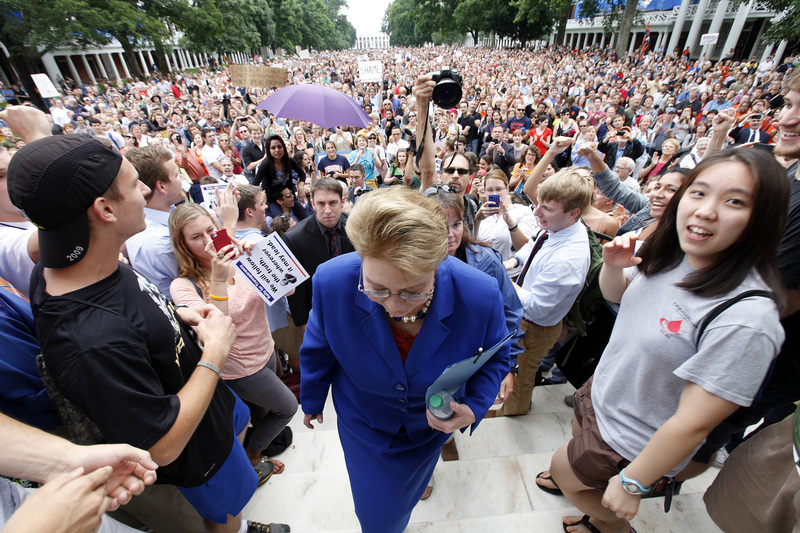 What is happening at UVA is the strength of a culture giving voice to its values when it feels trust has been broken. Students, faculty, and alumni are pushing back, requesting the board to reinstate Sullivan. The president is popular, but also paramount are the principles of transparency, honesty, integrity, collaboration, due process, and working through disagreements. It is, after all, the university Thomas Jefferson founded nearly 200 years ago. UVA describes itself as a “community of trust” — on admission tours, in classrooms, and now in rallies urging action to reinstate Sullivan. Thousands of students have held rallies in the past two weeks (one on June 24 was called A Rally for Honor). ). However, unlike the angry students rioting and arrested at the Pennsylvania State University over football coach Joe Paterno’s firing, UVA students have operated with civility. They’ve criticized the board’s actions, not the board. Under increasing pressure to provide more specific reasons for the action, Dragas indicated the Board of Advisors had the highest aspirations for UVA, and was concerned particularly about10 challenges. However, as faculty and others pointed out, all 10 – including state and federal funding, changing role of technology, changing health care environment, and fundraising – are challenges all institution face. Particularly offensive to the UVA community was the secretive process the board used in Sullivan’s removal; the rector individually talked to other board members – predominantly successful business leaders – but held no board meeting for a collective discussion and vote. Nor were board concerns directed back to the president and faculty for comment, discussion or proposed action. In addition, a few billionaire hedge fund alums dissatisfied with Sullivan’s approach and concerned about UVA maintaining its high rankings were alleged to be quietly involved with board leaders in ousting her. The push by business leaders for universities to follow a business paradigm isn’t new. However the push back calling for Sullivan’s reinstatement by alumni, students, faculty, and some members of the Board of Advisors caused Virginia Gov. Bob McDonnell, whose office has been inundated by messages to reinstate Sullivan, to issue the ultimatum to resolve the issue of the presidency by June 26. It is ironic that very successful business leaders – even those who are alumni — can so misread a culture and try to architect change by fiat and control rather than dialogue and building consensus. The drama at UVA isn’t about the good guys versus the bad. The Board of Advisors’ intention to help UVA succeed isn’t in question. In shared governance, university boards determine organizational direction, just as boards do in companies, but to do so without engaging the community obviously creates distrust. In response, at the Rally for Honor, students, faculty, and staff called for a change in the composition of the Board of Advisors to include participation by faculty, staff and students – an issue the governor will likely be called upon to address after the vote tomorrow by the board on whether or not to reinstate Sullivan. Culture is at the core of how an organization expresses itself. The Institute for Corporate Ethics, part of the Business Roundtable, is housed at UVA’s Darden School of Business. I asked Brian Moriarty, the Institute’s director, about UVA’s culture. “The entire UVA community takes values very seriously – they are alive in conversations and actions.” he said, citing the transparency with which, for example, the Darden School’s Dean, Robert F. Bruner, shares confidential information on the state of the school each month with all faculty and staff, trusting they will keep it confidential. As part of the ongoing university commitment to operating as a community of trust, Moriarty indicated Sullivan launched an initiative last year to foster a caring community and respectful workplace. The aim, he said, was to ensure a respectful work environment that leads to collaborative excellence, to find out when they come up short and develop guidelines and consequences to address it. Whether the outcome of the Board of Advisors’ meeting tomorrow reinstates Sullivan or not, operating as a community of trust has been dealt a significant blow by the board’s process. The board came up short. In how it and the overall community rebuild relationships and communication, the entire university community has the potential to reground itself in values it holds most dear – honor, leadership, ethics, collaboration, respect, and trust. Gael O’Brien is a Business Ethics Magazine columnist. Gael is a consultant, executive coach, and presenter focused on building leadership, trust, and reputation. She publishes the The Week in Ethics.